Just in time for Halloween, I am going to create my first Frankepattern. 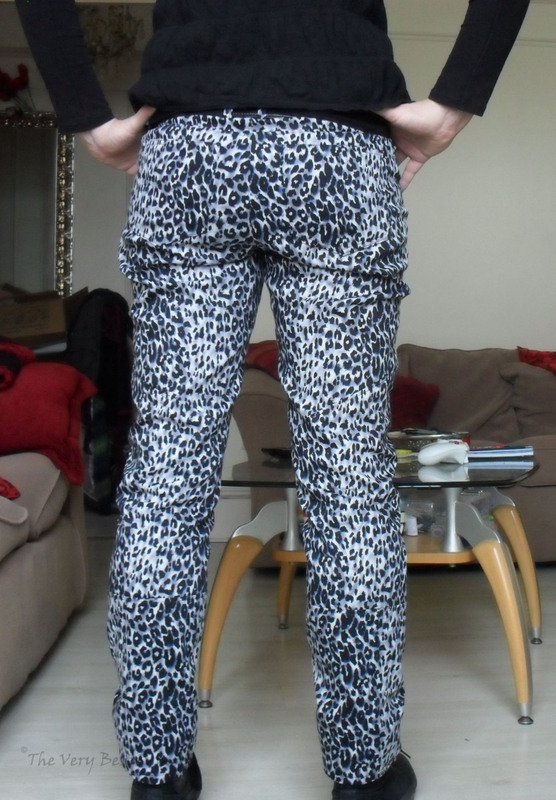 Although the muslin didn’t turn out too bad, and I’m pretty sure I’ll be making another pair of trousers with a side zip out of McCalls 6404, with slightly modified legs, I decided to go a different route for my Temperley knock-off. 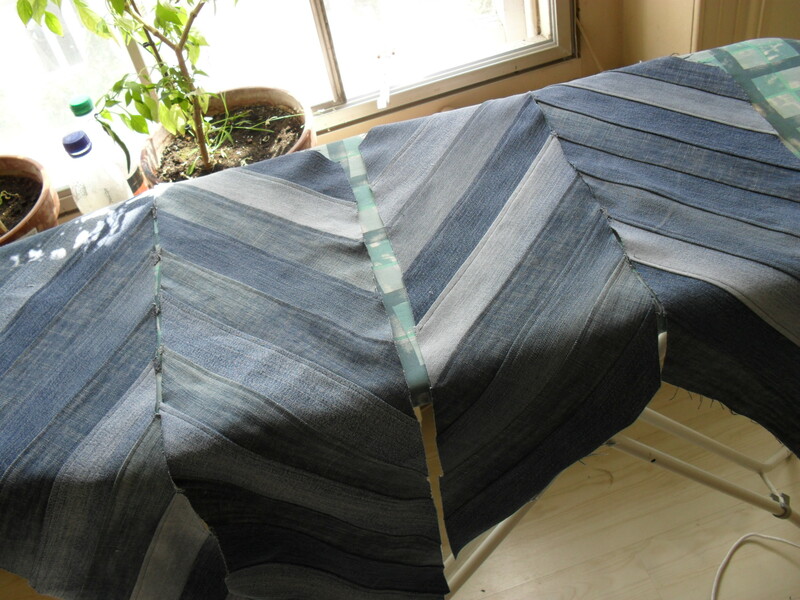 So I pulled out my TNT Jalie jeans pattern, and put it on the table with the leg pieces from the McCalls. At that point it dawned on me that maybe the ballooning in the knees I noticed in the muslin (like here) wasn’t all my fault for combining different fabrics. In fact, the pattern is much wider in the leg than my Jalie pattern, especially noticeable in the knee area. 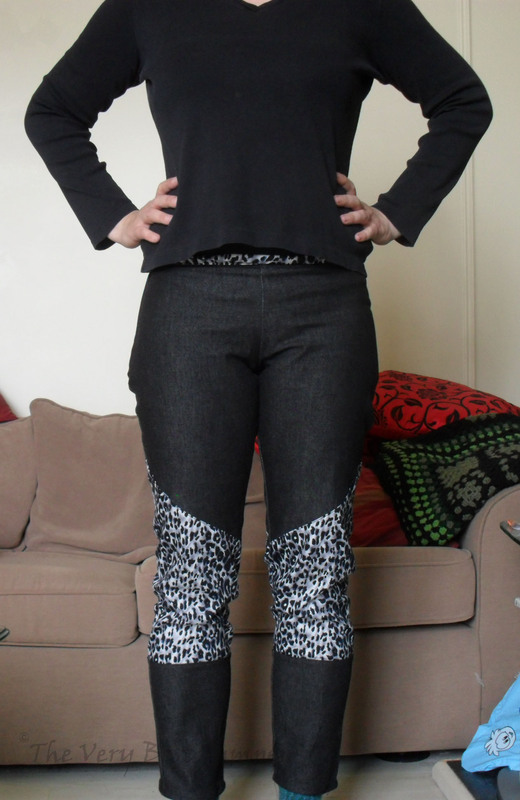 So I graded the pattern to fit the Jalie measures in the thigh, and took out ~1.5 inches in the knee area. Now all I got left to do is sew it up. 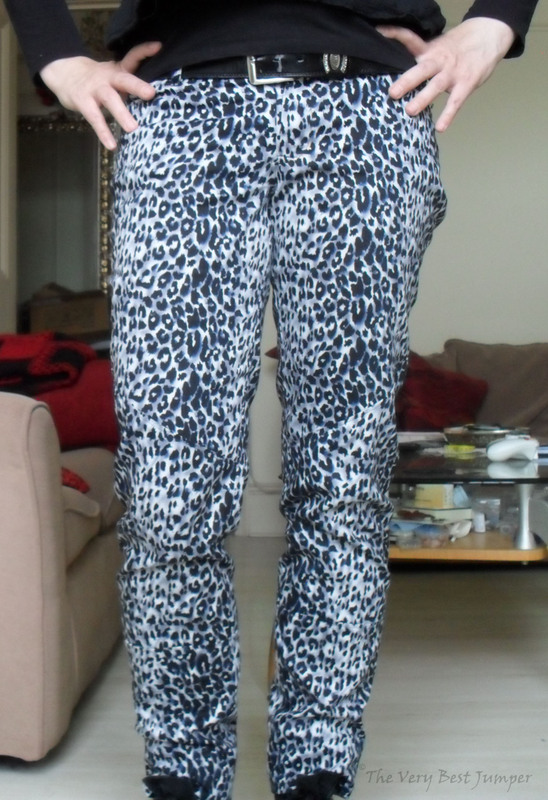 Do you think I should have stuck with the welt zipper pockets? I quite like the slanted jeans pockets, and I know that I never use zipper pockets (in my mind, they bunch up and create lumps on the outside) – but I’m still not entirely sure if they’re essential for the look? 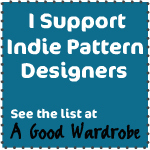 Author kokorimbaudPosted on October 31, 2012 October 31, 2012 Categories SewingTags animal print, fashion, Frankenpattern, jeans, leg pieces, McCall's M6404, Temperley knock-off, zipper pockets2 Comments on Frankenpatterning! 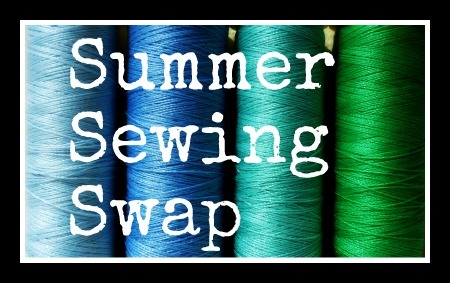 Everybody seems to be making sewing plans this time of year, and since I’m looking at having some more free time at my hands soon, some project planning seems like a great way to ward off the double dare of funemployment and fall. 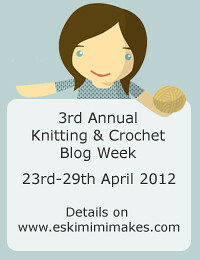 Also, the London Fashion Week is on, so I spent some time looking at the photos of various collections online. Actually, if you only watch one video of the event, watch this one – the totally delightful Burberry collection. Seriously, I’m in love. With Burberry. Who would have thought. Then I was pointed to a young indie designer, Alice Temperley. So I poked around her website and online store, and liked a few things, and gawked some more, and then it happened. I saw a pair of jeans. Please hold your yawns – they’re not like the Jalie jeans. 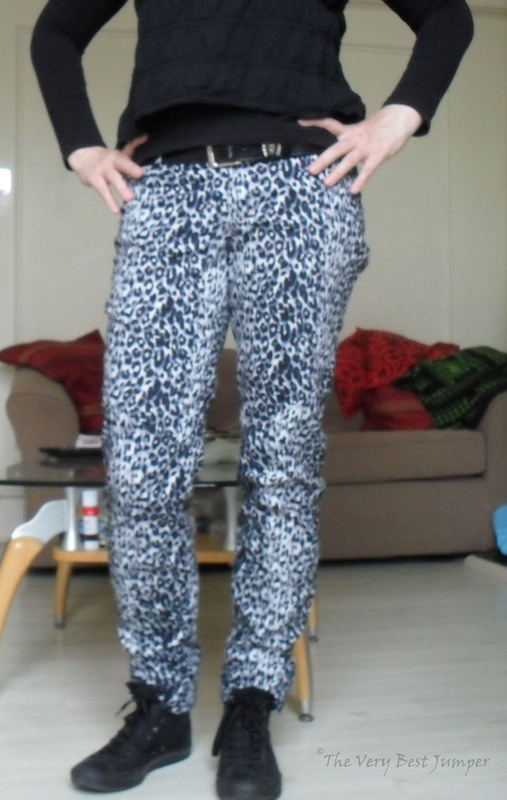 In fact, they’re more like leggings … should I say jeggins? For source, please click on the image. 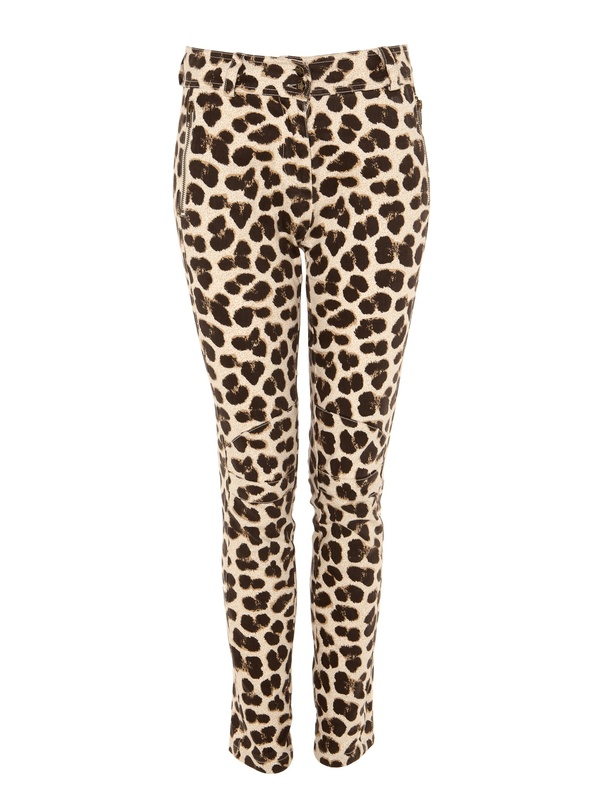 So now I’m slightly obsessed with finding stretch denim in cheetah/leopard print to make my version of the £300 designer leggins. But I digress. When I look back at my makes of the last few months, with an eye towards which items got the most wear, it’s clear that my initial assessment was spot on. I wear my two Jalie jeans in heavy rotation – the blue denim one a bit more, simply because it’s easier to pair with the rest of my wardrobe. The first one, made of a dusky pink corduroy, does see a fair amount of use, too, tho. I wear some of the tops I made, but not all – of the three Sorbettos I made, I wear one fairly regularly, the other two are sadly neglected. That’s partly due to fitting issues (the bust darts are pointing straight at … well, you get the gist, and somehow I never could be bothered to fix the pattern), and partly the fact that I’m living in the U.K. I’m of the shivery kind, which means long sleeve tees are pretty much a staple for me. Now, I do also knit, and while this is GREAT for cardigans, it doesn’t solve the problem. My long sleeve tees are from H&M (four black ones, which are in a sorry state due to being worn more or less constantly for well over 6 years now), and Primark. Neither of them has cost me more than £10, and it’s just so bloody convenient to walk in, grab a handful of them, walk out and be done with it. But I decided that needs to change. So I’m setting out to replace those well-loved and trusted tees over the next few months by hand-made ones. As coincidence has it, my friend Kim-ing pointed me towards The Seamless Pledge today. Ha, I thought – nothing but a bit of good old peer pressure to keep oneself on track! I, Kat, am taking the #seamlesspledge until 6 months have passed. For me, this means: No high street store bought clothes (with the sole exception of certain items of underwear, and tights) for the next 6 months. Disclaimer: Although making myself a new winter jacket is firmly on my list (and has gone into the planning stage already), I’ll reserve the right to buy a new one in case I fail spectacularly. Welcome to part 2 of my chevron fun time! I started by pinning the chevron stripes together like you see below. To make things a bit more efficient, I decided to sew one panel (2 x 9 and 2 x 11 strips) together, then iron the seam allowances all to one side, then topstitch them. Yes, all of them. 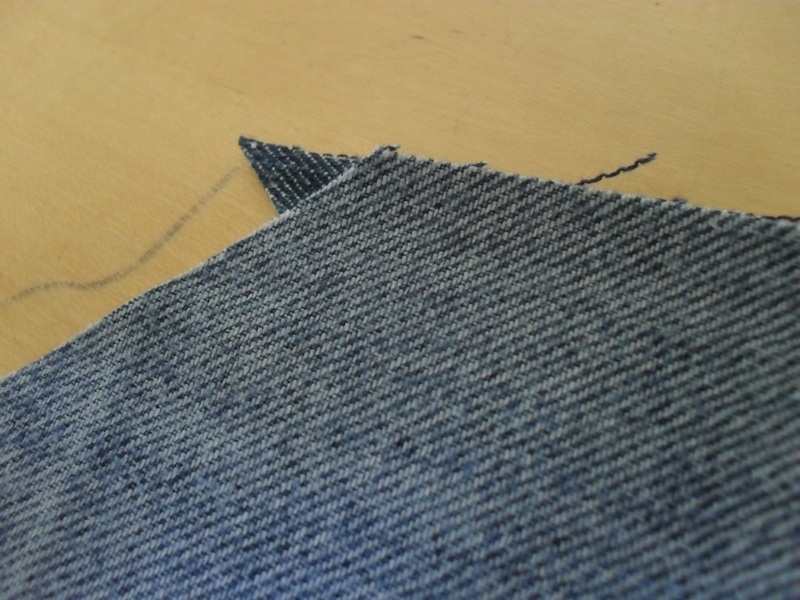 I know, it’s a bit crazy, but it’s denim 😀 it needs topstitching! Starting to look like chevron stripes! As you can see, despite my careful planning and cutting, not all strips lined up perfectly. That didn’t bother me too much, though, as at this point I had identified a crucial mistake in my calculations. 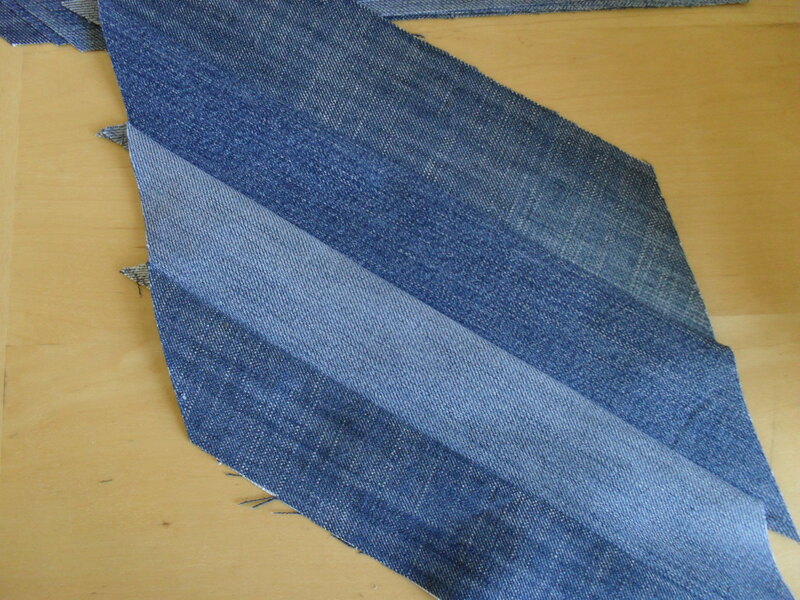 I had measured the full length of the stripes, assuming that 2 panels together would be wide enough to make a full skirt half (front or back). But while I pinned them together, it occured to me that due to the angled nature of the chevrons, this might not be the case. So I remaesured, and lo and behold, they’re not wide enough. What to do, what to do? Well, I decided not to panic and proceed as planned (for now). Surely I could come up with a plan to add some width? Up there are all four panels finished, but not yet put together. Nothing much to see, really, unless you step a bit closer and bend down to inspect them from close up. I am still not sure how I managed this. I even thought about it, and how I would make double sure to avoid it. But still, somehow, I topstitched the chevrons up on one front panel, and down on the other. Never one to be deterred by what I consider to be details, I plowed on. Although admittedly, I paused for a cup of tea and some cake (it is a well proven fact that tea and cake improve the thinking process, is it not?). Next time, I’ll tell you how I came up with a pattern around the panels 🙂 Till then, stay safe! It happened – the sun came out! And like any good geek, I did what we do after whingeing about the rain for months: I drew the curtains and played Skyrim all weekend. The best laid plans and all that … what can I say. I immensely enjoyed my time-out. Anyhoo, while pondering strategy and collecting herbs and having a few, good old fashioned brawls with bandits and the like, in the back of my mind I kept pondering an idea that’s been festering for weeks. 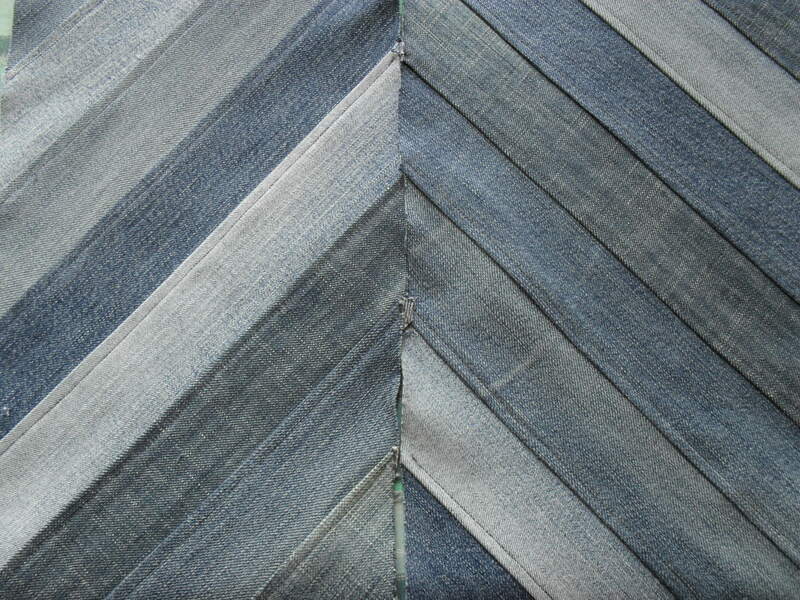 I would like to turn my old Jeans into a skirt, more exactly a chevron skirt not unlike this one. 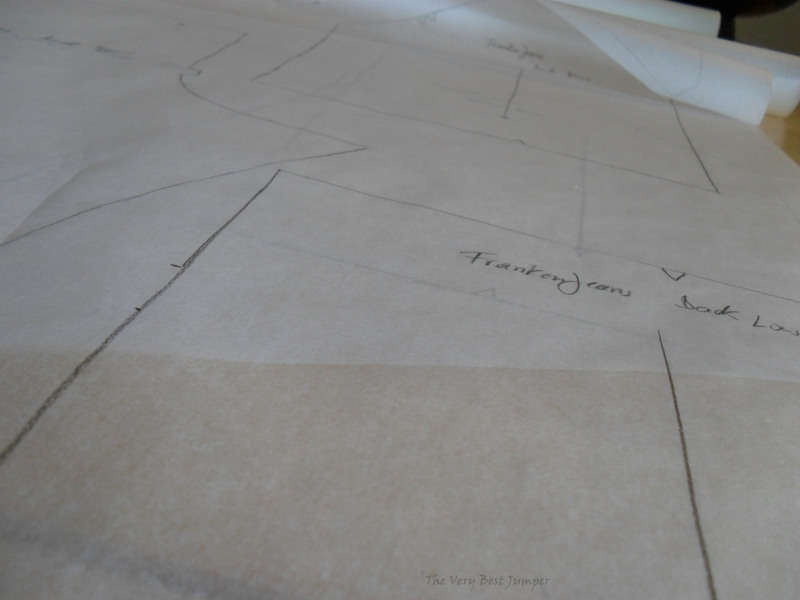 As it happens, however, I have not a single pattern for a fairly straight-forward, a-line skirt with a center seam. This seems to be simple enough, tho … I should be able to draft one myself? What do you say? And if you have any tips towards your favorite tutorial, I’d love if you left me a link in the comments.